Beautifully renovated top to bottom. Perfectly located at Bay and Yorkville. Exceptional service beyond compare. This is 61 Yorkville, Toronto’s best address in the heart of the city, where thoughtful luxury is inherent in everything thing we do. Living here gives you unmatched access to outstanding premium amenities and services – and the privilege of a lifestyle well earned. This is Y. Prices shown are best available, but may be limited to features, finishes, floorplan, availability and occupancy date. Prices shown reflect the average cost per room based on the number of rooms in a specific suite. The cost per room is based on occupancy equal to the number of rooms. Room rates may vary based on location in suite and square footage. These prices are subject to change without notice. Please speak to your Leasing Consultant or contact the Rental Information Line at 647-475-5932 for more details. Errors & Omissions excepted. 61 Yorkville represents the pinnacle of apartment rentals in Toronto; housekeeping services, room service from Pusateri’s and other fantastic amenities will make you want to live in one of Toronto’s most desirable neighborhoods. Life in Yorkville means you’re surrounded by boutique shopping, world-famous dining and any number of entertainment options. Grab a drink at Hemingway’s, savour authentic Italian at Buca or wander around the Royal Ontario Museum. Students will love being less than a 10-minute walk to the University of Toronto campus. For families, you’ll love being in this quiet, up-scale neighborhood which has a number of grocery options such as Whole Foods or Bloor Street Market to make finishing your errands a breeze. When you want to explore Toronto then living near the corner of Bay and Bloor gives you access to lines 1 & 2 on the subway, making it quick and easy to commute to the downtown core or reach the city limits. If you need to travel within the Greater Toronto Area, then Union Station is only a 10-minute subway ride away. Enjoy a life of luxury and convenience by choosing to live at 61 Yorkville. Living along Yorkville Avenue and around the corner from the Bay and Bloor Street intersection means that you’re steps away from the best amenities the city has to offer. In less than a 5-minute walk you can catch a movie at the Cineplex Cinemas Varsity and VIP, shop at one of the area’s multiple designer stores, or enjoy the green space around the University of Toronto campus by strolling down the famous Philosopher’s Walk path. When you get hungry, you’ll have plenty of options; pick up healthy groceries from Whole Foods or sample international flavours from restaurants such as Kasa Moto, La Société and many more world-renowned restaurants which are steps from your front door. The city is full of different communities to experience and travelling around is easy from these Toronto apartment rentals. Living near, Bay Street, Avenue Road, Bloor Street and Yonge Street gives car-owners easy access to the major roadways in the city. In less than 5-minutes you can get to the Don Valley Parkway to quickly reach the Gardiner Expressway or Highway 401 when you need to get around the larger GTA. If you don’t own a car then simply hop on one of three nearby subway stations – Bay Station, Yonge Station or Museum Station – to ride lines 1 and 2 to all ends of Toronto. Getting around from Yorkville doesn’t get any more convenient, as all your day-to-day errands, dining and shopping can be done on foot. Living near Bloor Street and between Yonge Street and Avenue Road means that you can quickly drive down to Lake Shore Boulevard for views of Lake Ontario, or along Bloor to scenic High Park in less than 15-minutes. If you want to take advantage of public transit, then head to one of three subway stations that are nearby. These stations can help you quickly access both Lines 1 and 2, making for an easy way to travel in all directions across Toronto. Cycling paths have recently been added along both Davenport Road, Bloor Street and St. George Street for easier cycling access to the city. There is no better location in the entire city for accessing the TTC. Living next door to Bay Station gives you quick access to Line 2 which travels East and West along Bloor Street. When you need to go North or South, you’ll be able to access both sides of Line 1 by walking to either Museum Station or Yonge Station. For anywhere else, hop on the nearby 6 or 300 bus routes. Everything is just a short-walk away from these apartment rentals in Toronto. 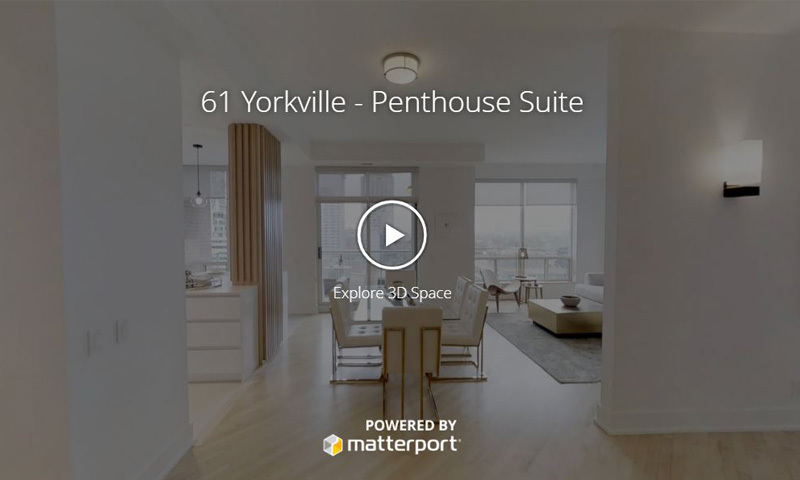 In less than 5-minutes you can explore the nightlife, fine dining and shopping in the Yorkville community. When you feel like taking a longer walk, head along Bloor Street or down Avenue Road or Yonge Street to reach the downtown core. Bike friendly paths along Davenport Road, Bay Street and nearby St. George Street make for an easy way to cycle around the city. These paths eventually lead down to Lake Shore Boulevard which offers some scenic routes along the Harbourfront. Bloor Street, Avenue Road and Yonge Street all offer quick ways for drivers to get anywhere in the city quickly. If you need to commute in the larger Greater Toronto Area, then you’ll love being close to the Don Valley Parkway, Allen Road and Highway 401.